Ten years after the financial crisis and a record bull market, a lack of security by U.S. investors still remains. Despite this uncertainty, Americans continue to have unrealistic expectations for investment returns and few truly understand the ramifications of market volatility, according to a new investor survey released today by Natixis Investment Managers ($999 Billion AUM). Most Americans (65%) say it is tougher now to get ahead financially. Almost half (48%) believe they are exposed to greater market risk today than they were before the 2008 financial crisis. Despite these feelings of unease, Americans continue to be unrealistic about their own return expectations. In fact, investors say they need an annual return of 9.8%, a rate which financial advisors say is unrealistic. Even though most Americans (82%) say they understand the risks of the current market environment, 38% are not willing to take on more risk to get ahead. Overwhelmingly, Americans prefer safety over performance (85%). Most (53%) blame market volatility on undermining their ability to reach their savings and retirement goals. When it comes to understanding the volatility risks of the market, most Americans still favor index funds. In fact, 64% believe index funds are less risky than other investments and 71% believe index funds can help to minimize losses. Half of U.S. investors admit they can’t identify most of the underlying investments in funds they own. Ten years after the financial crisis and a subsequent record bull market, investors struggle with conflicts between trust and security, the merits of active and passive investing and the right balance of risk and return. Investors’ annual return expectations jump to 9.8% from 8.9% in 2017, 43% higher than financial advisors say is realistic. Those who entered the financial markets after the financial crisis have even higher expectations for annual returns: 11.3% above inflation. Investors are conflicted: Return expectations are higher but tolerance for risk is lower: A growing number (85%) would take safety over investment performance if forced to choose. BOSTON, Nov. 16, 2018 – Two-thirds of US investors (67%) say they are prepared for a market downturn, such as the steep declines seen in recent weeks, according to a new investor survey released today by Natixis Investment Managers. Yet while eight in ten (82%) claim to understand the risks of investing in the current market, 53% think market volatility could undermine their financial goals. In fact, nearly half (48%) believe they are exposed to even greater market risks today than they were before the 2008 financial crisis, a sense of unease that seems to conflict with investor behavior and high return expectations. What investors do next will depend on how they reconcile views on risk, return and financial security with market realities. Many investors today (78%), including 86% of those who started investing after the financial crisis, are confident their portfolio is properly diversified; however, half (51%) admit they can’t identify most of the underlying investments in funds they own. This leaves them potentially unaware of overweighted exposure to certain sectors and geographies that have grown disproportionately faster than others and may need rebalancing. Still, just 53% of respondents overall said they have rebalanced their investments in the past year. While 92% of investors consider it more important for their investments to deliver long-term results than short-term gains, 28% are focused on short-term performance and 26% tend to sell off investments during periods of market volatility. Forty-one percent of investors who started investing after the financial crisis admit they tend to sell off assets when markets are volatile, possibly a reflection of their lack of experience managing volatility and the potential to use it to their advantage. The annual returns (above inflation) investors say they need to achieve to reach their goals is 9.8% (compared to 8.9% last year) – and 43% higher than what financial advisors think is realistic (6.3%). Those who weren’t invested during the financial crisis are seeking annual returns of 11.3% to achieve their investment goals. Achieving this level of returns would mean assuming more risk, to which investors demonstrate a clear aversion: More than eight in ten (85%) overall say they would choose safety over investment performance, up from 81% last year. In its report on the findings, Natixis identifies three areas of conflict investors need to resolve as they consider their investing approach: 1) how to balance risk and return, 2) the benefits of active versus passive investments, and 3) their sense of trust and security. The study finds that investors may understand risk in theory, but it’s often tested only after they experience it. Among those who lived through the financial crisis, 31% sold some or all of their assets in reaction to the steep market downturn. While the sale of certain high-risk assets is sometimes warranted, of those who sold at the time, 22% later regretted the decision. One in three (31%) wish they had gotten back into the market sooner, and another 22% still aren’t invested, or reinvested, at the level they were before the crisis hit. Most investors (74%) recognize that sudden 10 percent fluctuations in the market are a normal part of investing. Forty-seven percent view this kind of volatility as something they have to endure. Meanwhile, just 28% see volatility as an opportunity to get ahead. 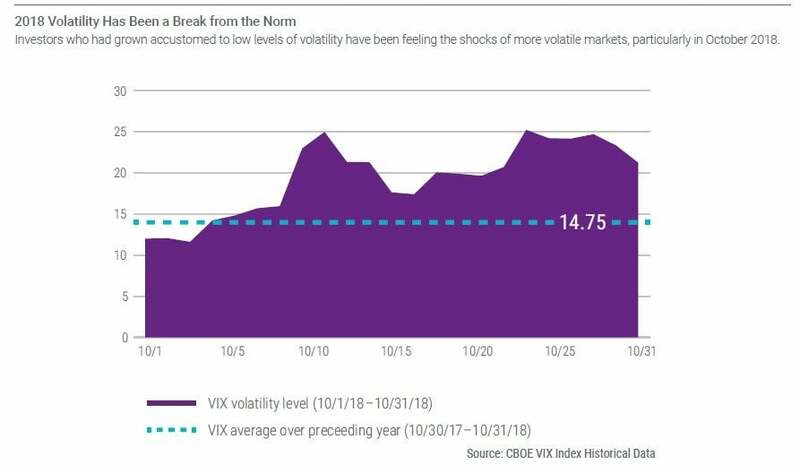 More troubling, perhaps, is that some investors (11%) think they need to avoid volatility altogether, while 15% admit they just don’t understand the effects of volatility on their investment performance. Investors most likely to say they don’t understand market volatility are those who don’t have a financial advisor (20%). Not only are investors who have a financial advisor more likely to understand volatility, they are more comfortable taking risks to get ahead (65%) than those who don’t have an advisor (55%). In relation to market instability, rates present a new conundrum. After ten years at historic lows, interest rates have slowly inched up, driving volatility that has rattled some investors. More than half (57%) are worried about the negative effects that rising interest rates could have on their investments. 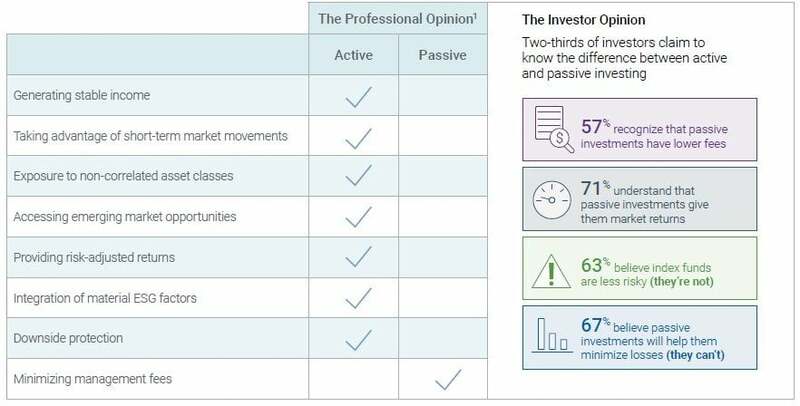 Nearly two-thirds (64%) of investors claim to know the difference between active and passive investing, but the findings suggest some may be hearing only part of the ongoing active-passive dialogue that focuses on fees. Almost nine out of ten (88%) investors consider fees an important consideration when they are selecting investments, and 53% recognize that passive investments, such as index funds, tend to have lower fees. Meanwhile, 64% of investors also believe that index funds are less risky than other investments. And 71% of investors think index funds can help to minimize losses, 15% more than what investors said last year. The findings suggested that a larger percentage of investors may be confusing lower fees with greater value. Even while some might praise the virtues of passive investments, respondents’ preferences tend to favor active management. Seven in ten investors say they prefer an expert to find the best investment opportunities in the market, and 76% say it’s important to beat the benchmark. Despite the gains investors have enjoyed during the long bull market, along with a heightened sense of financial security, they also are unsettled by the pace and magnitude of change that has left them feeling generally wary and insecure. Only one-third (32%) of the investors Natixis surveyed would say the world today is a more secure place than it was ten years ago. Sixty percent don’t consider the government trustworthy, and nearly as many (57%) don’t think the media is either. At the same time, 65% feel as though it’s only gotten tougher to get ahead financially. Surrounded by so much uncertainty elsewhere in the world, investors are willing to place their trust in the financial system. When it comes to making financial decisions, 70% trust financial institutions and 75% trust financial advisors generally. 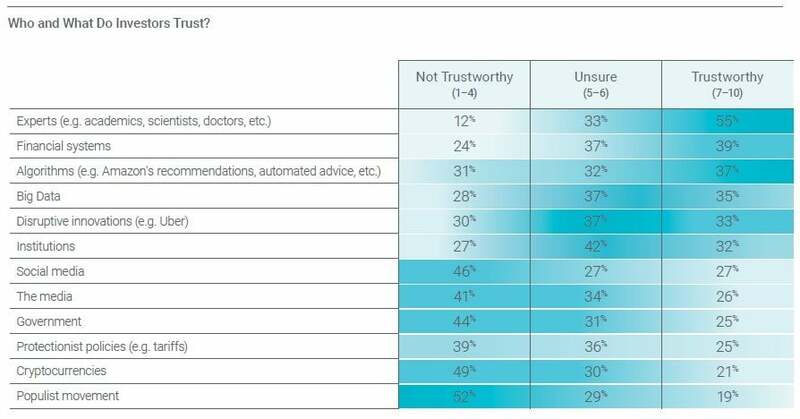 Fully 90% of investors consider their own financial advisor trustworthy, far more than those who consider close friends, family or co-workers trustworthy when it comes to making financial decisions. In fact, most investors (68%) say those who have a professional financial advisor are more likely to reach their financial goals. To download a copy of the full report, titled “Out of the Chaos and into Conflict,” visit im.natixis.com/us/research/individual-investor-survey-conflict-2018. 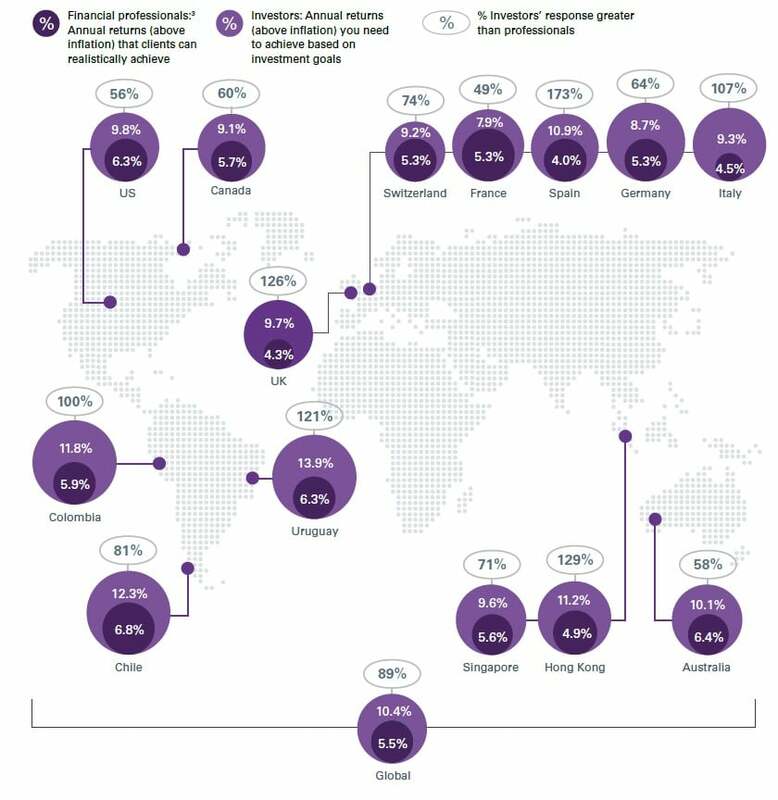 Natixis Investment Managers 2018 Global Individual Investor Survey was conducted by CoreData Research in September 2018. The survey included 9,100 investors in 23 countries and regions including Asia, Continental Europe, Latin America, and the Americas. In the US, CoreData surveyed 750 investors with a minimum of $100,000 in investable assets. The group included 177 members of Generation Y, also known as Millennials (age 22 to 37); 202 from Generation X (age 38 to 53); 296 Baby Boomers (age 54 to 72); and 75 from the Silent Generation (over age 72).